Jewish congregants of the turn of the century walked to synagogue, so these places of worship tended to be embedded within residential areas. Prosperous Anglos occupied "Quality Hill" further north while the wealthier Jewish population lived in the area near where Discovery Green now serves as a downtown playground. The fine Romanesque worship hall for Congregation Beth Israel was built at 1015 Crawford at Lamar in 1908. Jews at that time were not integrated into the larger white protestant and catholic communities, but prejudice was not generally oppressive. "Separate but Equal" was the watchword of the time, and the Jewish community, far more prosperous than the African American communities of the day, was mostly treated with guarded respect. 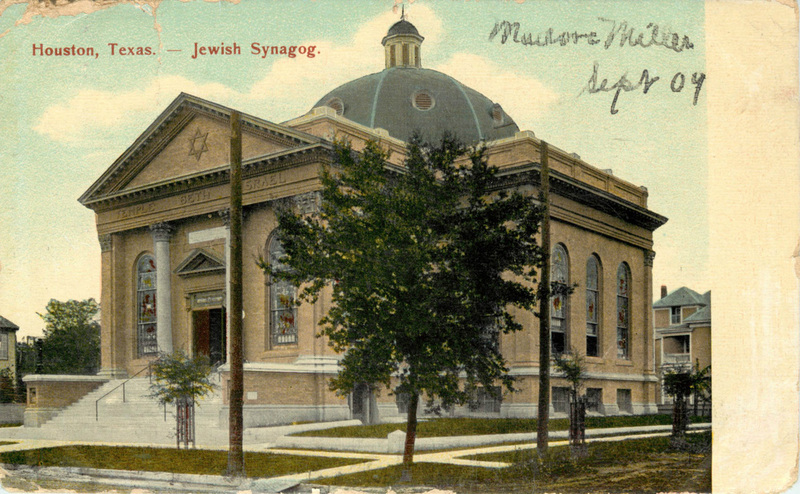 Beth Israel's synagogue was in use until the congregation sold it in 1923 to build a new Greek Revival building at Austin and Holman, now the auditorium at Houston Community College. During most of the time when Beth Israel occupies this synagogue the rabbi was Henry Barnstein, who in 1910 lived as a boarder in the house of Estelle Levy at 702 Gray at Louisiana, about 1.3 miles from the building. The British-born Barnstein was a cultural leader and founder of the Houston Museum of Fine Arts and the Houston Symphony Society, board member of the Houston Public Library. He brought a level of refinement and sophistication to the community and was active in interfaith work. 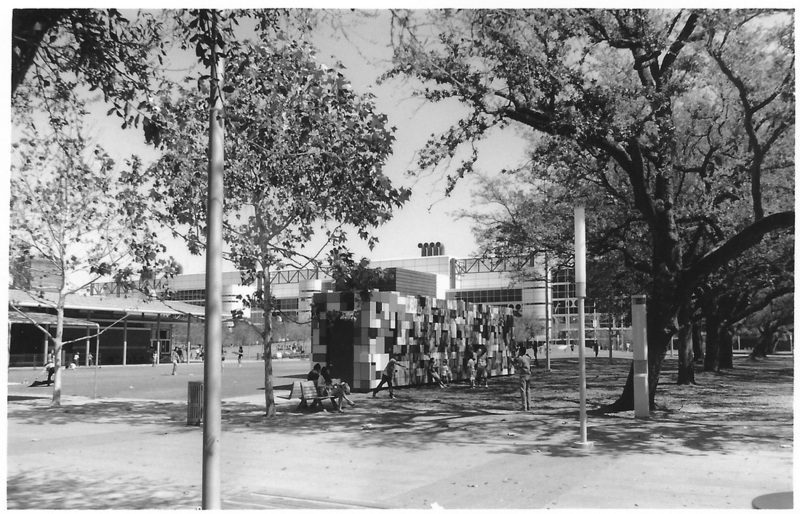 Encyclopedia of Southern Jewish Communities: Houston. Published by the Goldring/Woldenberg Institute of Southern Jewish Life (ISJL), an online resource on the culture and legacy of Judaism in the South. Published 2011, article based on The Jews of Houston: An Ethnographic Study (New York: AMS Press, 1989), by Elaine Maas. Your card from Canada received several days ago. I suppose you have received the picture of the "Bunch" by this time. My brother-inlaw, is finishing the other pictures & has not sent them to me yet. Will send you some as soon as I get them. Hope you had a safe journey. Madora Miller. [inverted above text block] I have heard from Mr. Lenard and Mr, Dickey but have not heard from Misses Hubberd. 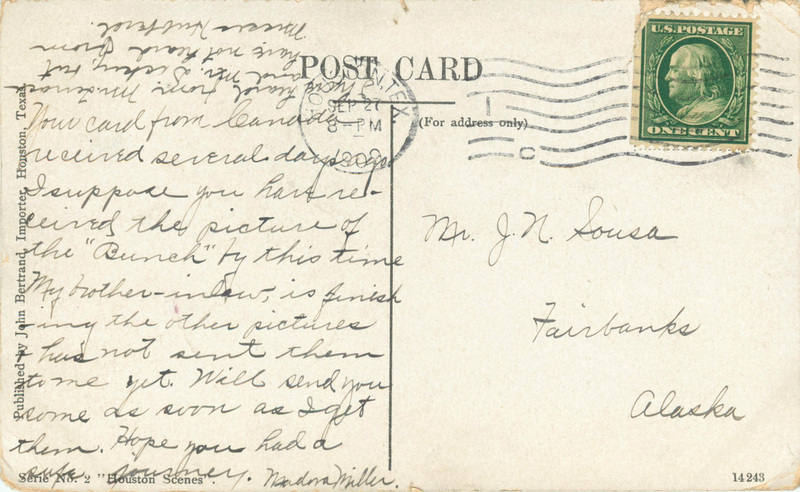 "Madora" is such an uncommon name that any Madora Miller in Houston is almost certainly the author of the postcard. The census of 1910 reveals two Madora Millers, mother and daughter. The message strongly suggests that the sender is the daughter. Madora Miller sounds more like a young woman with an active social life than an older woman settled into a domestic life with a family. Mention of the "Bunch" suggests Madora is an active part of a social group or set of friends with some common interest. The recipient, J. N. Sousa in Fairbanks, apparently knows some of the "Bunch" and Mr. Lenard, Mr. Dickey and Misses Hubberd. A search of internet genealogy sites reveals a great deal about Madora Miller. The Miller family lived at 1019 Roy at Washington in 1910. The mother was 51 living with her second husband, James E. Miller, a real estate agent whom she married in 1889. The daughter was 20, working as a stenographer for an iron company. Also in the house was James and Madora's other daughter, La Vera, 18 working as a stenographer in a law office and her step-brother William McCutcheon, 26, working as a stenographer for a railroad. McCutcheon was Madora, Sr.'s son from an earlier marriage. The family had come from Oregon where in 1900 they lived in Pendleton, Umatilla County. The elder Madora was a dressmaker there, mother of 5 children, all still living, with Madora 10 and Lavera 9. Why the husband was not living with the family is not clear, perhaps he was already scouting Houston for a job. Madora Sr.'s other children were: Frederick K. McCutcheon, born 1883, married Rose Ella Warfield; and Marjorie E. McCutcheon, born in Missouri in 1894, married 1) John S. Kees, and 2) Emory West Reeves, MD. The brother-in-law with the photographs mentioned in the postcard must be husband of her sister Marjorie, ie Marjorie Kees, who at the time of was still living in Pendleton, OR. Marjorie would later marry again, to Emory West Reeves, and live in Houston at 507 Pecore in the Heights. Further research revealed proof that the author of the postcard is Madora, the daughter. 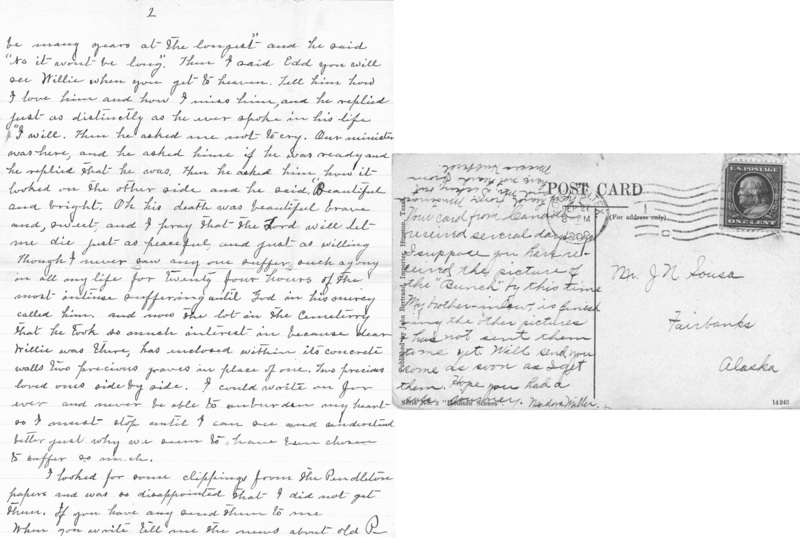 When William McCutcheon died in 1914 his mother wrote a letter which allows a handwriting analysis to show definitively that the mother did not pen the postcard (see below). In 1920 Millers were still at the 1019 Roy address which they owned outright. By then both daughters were working as stenographers for an express company. The Miller family remained there through 1930 when the household consisted of Lavera, still a stenographer for a railway express company, as head of household and owner of the house with her mother. As a second family living with them was John C Ballew, 50, and Madora M. Ballew and daughter Adrienne age 8. John, chief clerk at a railway express company and Madora were married about 1920. At the time of their marriage John C Ballew, was a clerk at an express company living at 1008 Polk at Main in a large boarding house. Prior to to coming to Texas John Ballew lived in Little Rock, Pulaski County, AR in 1910 as a clerk for an express company. Some time before 1935 John Calvin Ballew bought a house at 3008 Norhill in Houston Heights between Woodland and Euclid. John was by 1940 the depot agent for a railway express company. Lavera lived with them, working as stenographer for probably the same railway express company, while Adrienne was in college. Adrienne Madora Ballew was a student at the University of Texas in Austin and married Paul Duane Hayslip on 23 Dec 1966 in Fort Bend County, Texas. Paul died in 2010, but Adrienne is apparently still living. Most of the family are buried in Hollywood Cemetery on North Main in Houston. James Edward Miller - Birth: Jan. 4, 1853, Indiana, USA; Death: Jan. 22, 1915, Houston, Harris County, Texas, USA; Son of James E. Miller and Eliza Campbell, married to Madora Richardson. Harris County, Texas, USA; Daughter of William Cherry of Virginia and Cynthia Levens of Missouri. She married James Edward Miller and he preceded her in death. Son of William McCutcheon and Madora Cherry. Lavera Miller - Birth: Aug. 17, 1890, Oregon, USA; Death: Sep. 12, 1968, Houston, Harris County, Texas, USA. Daughter of James Edward Miller and Madora R. Cherry. Texas, USA. Daughter of James Edward Miller and Madora Richardson Cherry. She was the wife of John Calvin Ballew. The informant for her death certificate was Adrienne M. Hayslip. John Calvin Ballew - Birth: Nov. 28, 1882, Arkansas, USA; Death: Nov. 23, 1957, Houston, Harris County, Texas, USA. Son of Thaddeus Ballew of North Carolina and Jane Cox of Arkansas. He was married to Madora Miller. He was a retired depot agent for Railway Express in Houston and was a veteran of World War I. Year: 1910; Head of Household: James E. Miller. Census Place: Justice Precinct 1, Harris, Texas; Roll: T624_1561; Page: 35B; Enumeration District: 0040; FHL microfilm: 1375574. Find A Grave Memorial# 65188040 for Madora Richardson Cherry Miller, born May 1864 in Bunceton, Cooper County, Missouri; died 18 August 1934 in Houston, TX. Find A Grave Memorial# 65189182 for Madora Miller Ballew, born 17 November 1890 in Pendleton, Umatilla County, Oregon; died 5 February 1971 in Houston, TX. Find A Grave Memorial# 65189907 for William Lilburn McCutcheon, born 1 December 1887 in Missouri; died 12 September 1914 in Houston, TX. 1890 in Oregon, died 12 September 1968 in Houston, TX. Find A Grave Memorial# 65187622 for James Edward Miller, born 4 January 1853 in Indiana; died 22 January 1915 in Houston, TX. Find A Grave Memorial# 65190681 for John Calvin Ballew, born 28 November 1882 in Arkansas; died 23 November 23, 1957 in Houston, TX. Year: 1900; Head of Household: Madora Miller. Census Place: Pendleton, Umatilla, Oregon; Roll: 1352; Page: 12B; Enumeration District: 0116; FHL microfilm: 1241352. Year: 1930; Head of Household LaVera Miller. Census Place: Houston, Harris, Texas; Roll: 2344; Page: 20A; Enumeration District: 41; Image: 40.0; FHL microfilm: 2342078. Year: 1940; Head of Household John Calvin Ballew, Census Place: Houston, Harris,Texas; Roll: T627_4192; Page: 9B; Enumeration District: 258-73. Year: 1910; Boarder John C Ballew. Census Place: Little Rock Ward 6, Pulaski, Arkansas; Roll: T624_62; Page: 8B; Enumeration District: 0126; FHL microfilm: 1374075. Barnard Family Tree on Ancestry.com: Owner: socalyard. Left: Madora Miller, Sr; Right Madora Miller, Jr. The census of Alaska in 1910 was a little different than the census in most of the rest of America. In Alaska census day was 31 December 1909, while in the lower 48 it was April 15th 1910, a fact which resulted in the strange circumstance of Joseph N Sausa being on the census of 1910 twice. First he was found in Garden District in Fairbanks in 1910, a 31 year old Californian whose parents were born in Portugal. He was listed as a divorced man working in the mining industry and living in a large boarding house. In April he is back in Sacramento, living at 1117 V Street [less than a mile from where this author lived in 1971 at 1705 N Street]. He is listed as single in his brother Marshall's household with their mother Caroline (61) and a servant. His mother and father were both born in Portugal, so this is highly concordant with the Alaska record. A decade earlier he was in Sacramento with his wife of 3 years, Mary Sousa. A point of confirmation is that both parents were born in Portugal. Joseph later married again and is buried in Alameda, CA. How Joseph Sousa and Madora Miller became acquainted is not yet clear, but if Joseph was traveling a lot, he may have encountered Madora in Oregon on some trip. More research needed. Joseph N. Sousa, Head of Household - Ancestry.com. 1910 United States Federal Census [database on-line]. Provo, UT, USA: Ancestry.com Operations Inc, 2006. Marshall N. Sousa, Head of Household - Year: 1910; Census Place: Sacramento Ward 7, Sacramento, California; Roll: T624_93; Page: 9A; Enumeration District: 0120; FHL microfilm: 1374106. Joseph Sousa, Head of Household Year: 1900; Census Place: Sacramento Ward 7, Sacramento, California; Roll: 98; Page: 8A; Enumeration District: 0090; FHL microfilm: 1240098. Joseph Sousa SS#: 557-09-1394; Last Residence: 94618 Oakland, Alameda, California; Born: 2 Oct 1878; Died: Jul 1970.